You will have plenty of room for displaying all your collectibles with this 3 Piece Sliding Door Curio Cabinet! This masterpiece is stunning in any dining room, family room or den area! With 4 adjustable glass shelves with plate grooves to ensure security and stability, this handcrafted piece of furniture will become a magnet for guests to view its contents that are proudly on display! 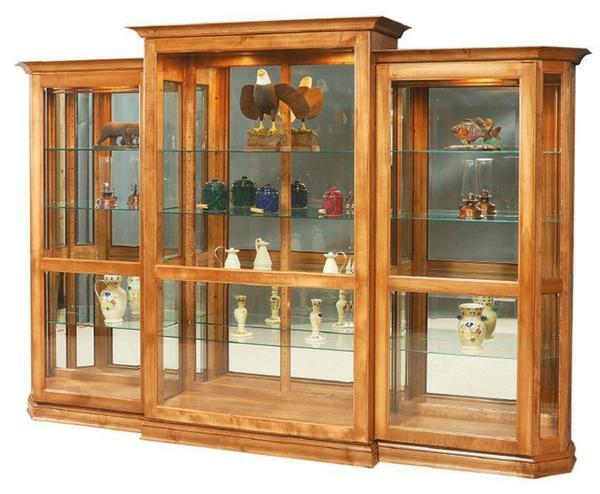 This luxurious 3 piece Curio Cabinet is handcrafted here in the U.S.A. Please call us at 1-866-272-6773 with questions on this heirloom piece that will be passed on to future generations. When the 2 side doors are open the overall width is 160".